The Standard 45TDMKD accessory comes without the Pipe, you can refer to the other Model Numbers for Standard Pipe sizes as indicated. Your particular application may require use of six-way guying via a TA45G (sold separately). 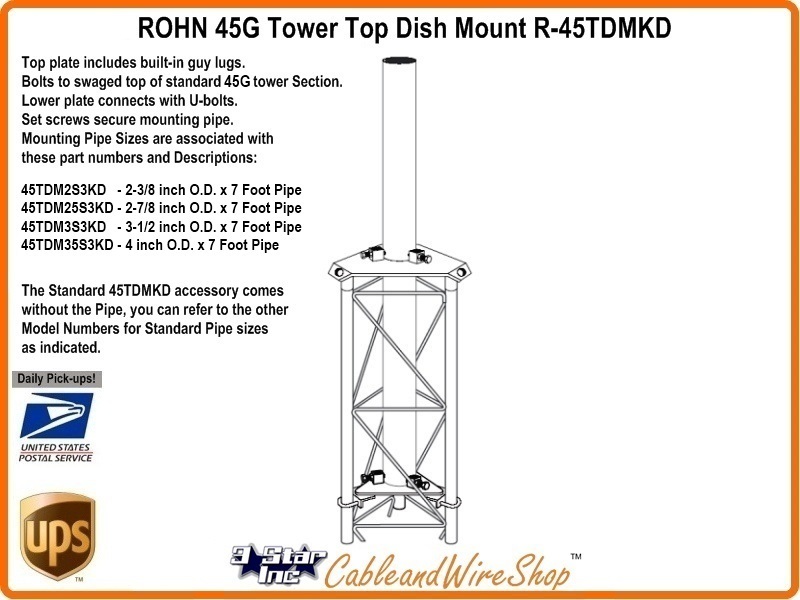 Note: ROHN 45TDMKD is Manufactured for Mounting a Real S/C/Ku Band Fixed, Offset or Steerable Dish (EL/AZ or Polar Mount) on the Top of your ROHN 45G Tower above any Trees and Buildings that may Block your view of the Satellite Orbital Arc (Clark Belt). For Tower Mounting 1.0 meter, 1.2 meter, 1.3 meter, 1.5 meter, 1.8 meter, 2.4 meter, 2.8 meter, 3.0 meter, 3.1 meter Satellite Dishes to receive SKY, IndoSat, BBC, Free to Air, Panamsat, ITV and other DBS Programming. Understand that the Physical characteristics of Composition (Solid vs Mesh) and Reflector Size will determine Wind Load that will influence the Height, Guying and Wind Survivability of the Dish, the ROHN 45G Tower and Structures they are mounted on. It is Suggested that Engineering (both Feasibility and Structural) precede any Potential Purchase of this Product Line for this purpose. ROHN Products, LLC nor 3 Star Inc, et al make no Engineering Representations as to the Suitability of this Product for use in conjuction with a Particular Dish/Mounting Scenario.